hello del could I have one, a tarot reading please? Here we have Castor and Polydeuces, the Warrior Twins. This shows a recent sudden change in your life. This could be an individual coming into your life possessing fascinating but disruptive qualities. Or it could be in the form of a new idea or vision which you have come up with from within your self that could have thrown your ordinary life into disorder. Whatever this is, it will lead to a broader vision of life. 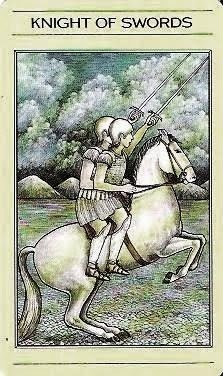 Currently you are feeling the birth of something new with regards to your feelings. The Page of Cups can suggest something fragile and delicate, easily misunderstood and easily crushed. This can mean the death of old feelings and the beginning of new ones and can mean a new relationship or quality of feeling within one and sometimes the birth of a child. 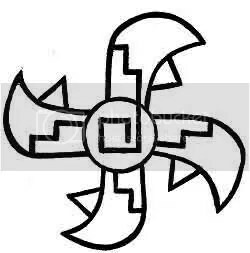 Here is the Ancient God Cronos. The message here is the lesson of time and the limitations of mortal life. Ahead is a time of aloneness (sic) or withdrawal from extroverted activities of life so that wisdom and patience may be acquired. If you are willing to wait, there will be opportunity to build solid foundations ahead. You know me too well Del. But those two knights riding one horse has been me journey of late. 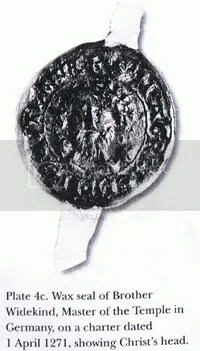 Have I not been writing quite a bit about the Knights Templar lately? People reading this thread are going to think we are PM buddies. 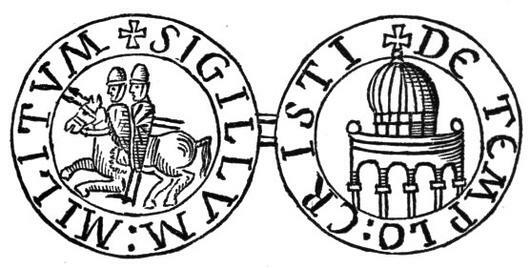 The Knights Templar were known by this symbol. 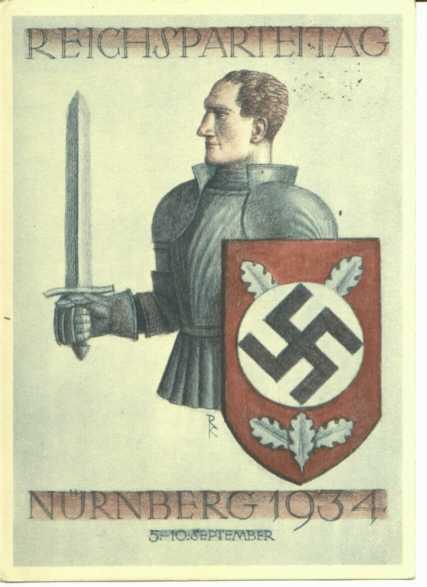 Exactly the same symbol as the Knight of Swords card. And yes you are correct that the Page of Cups refers to the Holy Grail that I seek. Which brings us to the third card. 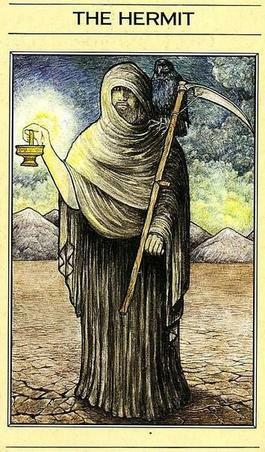 And to find the Holy Grail within, the immortal soul, a wiser understanding of TIME is necessary, accessed through the wisdom of the Hermit. yo Del, there could be a possibility of nobility in mi true blue genes or were they lederhosen? A little bit of Eliphas Levis mixed in with Johnny Dee Lee and the wisdom of the Master of the Temple? Maybe that is why I haved tuned into this particular frequency? Maybe that is why I ‘feel’ what I do, accompanied with a certain ability to ‘see’ the archetypal images? After so many ‘maybe’ all I can say is what if? The name of the master Widekind translates to ‘child of the forest’. 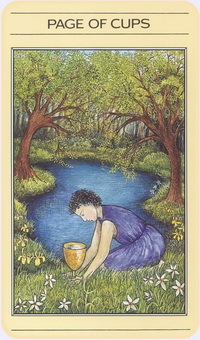 Which reminds me of the Page of Cups card, we see above. My first name translates to ‘counsel of the wolf ‘. The wolf I must conclude is Milo Wolff and his Spherical Standing Wave Theory. He is helping mi remember the archetypal wisdom of the master. So do I climb the family tree by following the branches UP or follow its roots DOWN? Hey Fibonacci what would you say? What would the path look like? As a Knights Templar I feel I know where the path leads. 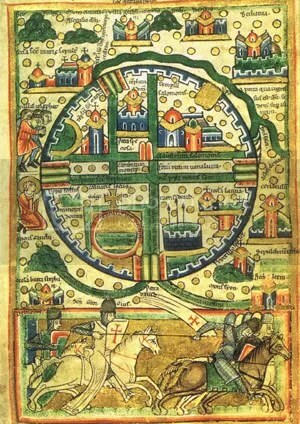 A 12th century map of Jerusalem that shows what the Templars were ACTUALLY battling. Take a look at the bottom of the image. 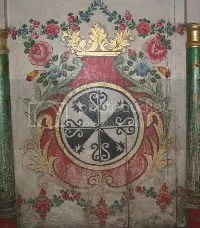 I found the same 5 colors on a very significant mandala in a Roman Catholic monastery in Peru. 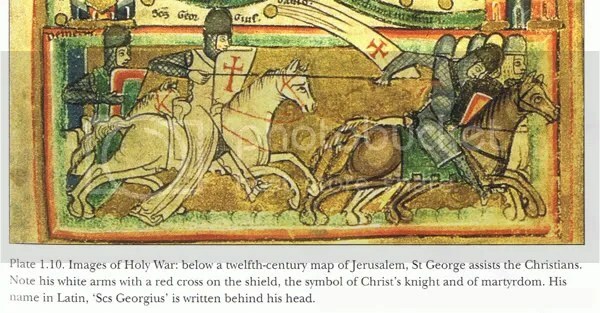 Do you see the proof that suggests another reason why the Knights Templar were chased out of town by the treasurer, the Vatican and the sheriff, the King of France? Do you see it Del? 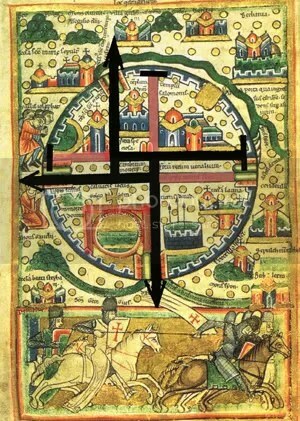 And in this battle I see the Black Knight is associated with the 5 colors that we see depicted in that Catholic / Peruvian mandala. We see the 4 colors as depicted in the stages of alchemy on the shield of the Black Knight. Heraldry / symbolism was very very very important in the 12th century. 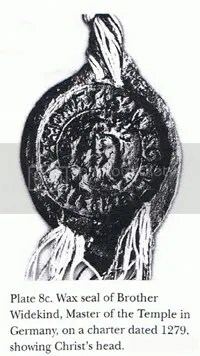 And the Black Knight is sitting on a green horse blanket, or between two Emerald Pillars that we see in the mandala, or why not hide or veil everything behind an Emerald Tablet? And with interest I note that the lance is piercing the side of the Black Knight too. Just like Christ who reportedly was pierced in the side, immortalized by the Spear of Destiny. Curing the blindness of the Roman soldier. 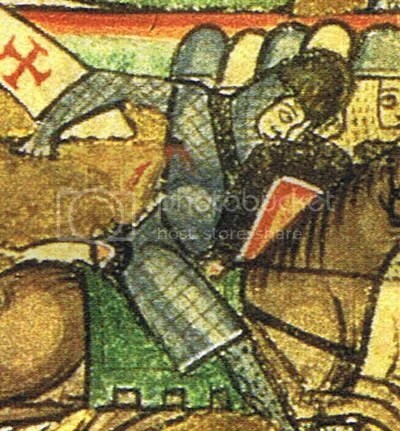 Why was a blind soldier carrying a lance? … according to James Churchward and his narrative called Mu. 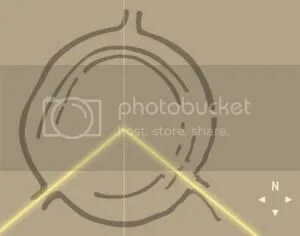 I am working on a post where I place the KEY to Universal Movement over this map of Jerusalem, above, illustrating a profound link to a bowl from 5000 BC (below) which has been animated. A city divided into 4 quarters, 4 different beliefs that could maybe be represented those 4 colors. 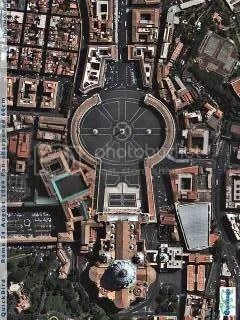 The Vatican is both LOCK and KEY, as we can see. 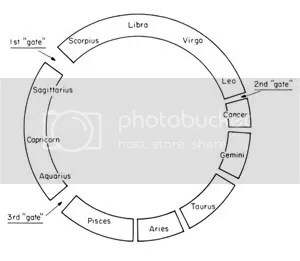 It is not a coincidence we can count representations of 3 Gates in all the above images. Take a look at your keyboard. What glyph shares the 3 KEY? 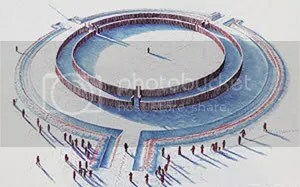 Do you see a GATE? The matrix or matricks is like that, it likes to play trix. Having a sense of humor helps to see and feel the connections. you get them as soon as they arrive. the only delay is how quickly I can post. my posts are like a diary, where I continually build on them, a momentum. that is what 2012 is about … gathering momentum. to make the leap … across the abyss. to jump a valance maybe. theveryfrequency is .all.but.still., no numbers, 2012, so approximately.